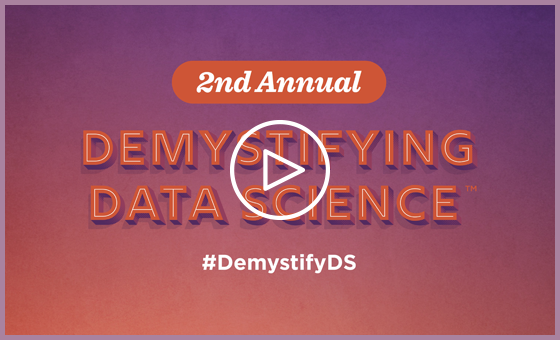 Demystifying Data Science is a wrap! Sign up to receive access to recordings of all 28 speakers' presentations and Q&A. Beth Comstock is a change maker. Her mission is to understand what’s next, navigate change and help people and organizations do the same. By cultivating a habit of seeking out new ideas, people and places, she built a career path from storyteller to chief marketer to GE Vice Chair. In nearly three decades at GE, she led efforts to accelerate new growth and innovation, initiated GE's digital and clean-energy transformation, seeded new businesses and enhanced GE’s brand value and inventive culture. As President of Integrated Media at NBC Universal, Beth oversaw TV ad revenue and new digital efforts, including the early development of hulu.com. Beth is a director at Nike, trustee of The National Geographic Society and former board president of the Cooper Hewitt Smithsonian National Design Museum. She graduated from the College of William and Mary with a degree in biology. Her first book, Imagine it Forward, is about summoning courage and creativity in the face of change and will be out September 18, 2018. Lillian Pierson, P.E. is a data strategist, trainer, and tech business coach who improves career prospects of tech professionals by teaching them the tools, principles, and practices they need to grow their brands and income. She advises SMEs and entrepreneurs on the data technologies, methods, and strategies that they can use to solve problems that their business faces. She is a licensed professional engineer, the founder of Data-Mania LLC, and the author of 3 technical books, the largest being Data Science for Dummies. She is also a course author to several data science courses for LinkedIn Learning. Since starting Data-Mania in 2013, she’s provided consulting services to numerous Fortune 500 companies. Dr. Kirk Borne is a data scientist and astrophysicist who has used his talents at global technology and consulting firm Booz Allen Hamilton as an Executive Advisor and as the firm's Principal Data Scientist since 2015. In those roles, he focuses on applications of data science, data management, data mining, machine learning, and machine intelligence across a wide variety of disciplines. He also provides leadership and mentoring to multi-disciplinary teams of data scientists. Before coming to Booz Allen, Kirk was professor of astrophysics and computational science at George Mason University for 12 years, where he did research and taught students in the undergraduate data science and graduate computational informatics programs. Prior to that, Kirk spent nearly 20 years supporting data systems activities for NASA space science missions, including a role as NASA's Archive Project Scientist for the Hubble Space Telescope. Dr. Borne has a B.S. degree in Physics from LSU, and a Ph.D. in Astronomy from Caltech. He is an elected Fellow of the International Astrostatistics Association for his lifelong contributions to big data research in astronomy. Since 2013 he has been listed consistently each year as a top worldwide influencer in Big Data and Data Science on social media. Mico Yuk, Co-Founder/CEO, BI Brainz, Co-Founder of Analytics on Fire Community & Podcast, Founder, BI Dashboard Formula methodology, Author, Data Visualization for Dummies (Wiley), BI Advisor to the Fortune 500, Global Keynote Speaker, Named Top Analytics Blogger, SAP Mentor Alumni, Microsoft PASS Board Advisor, Formerly Founded, Xcelsius Gurus Network & EverythingXcelsius.com. To find out more about Mico, visit http://micoyuk.com. Jake VanderPlas is the Director of Open Software at the University of Washington’s eScience Institute, where his work focuses on data-intensive physical science research in an interdisciplinary setting. In the Python world, Jake is the author of the Python Data Science Handbook, and is active in maintaining and/or contributing to several well-known Python scientific computing packages, including Scikit-learn, Scipy, Matplotlib, Astropy, Altair, and others. He occasionally blogs on python-related topics at http://jakevdp.github.io/. Bob Hayes is a researcher, writer, and consultant who likes to solve problems using the scientific method. His interests are at the intersection of customer experience, data science, and machine learning. Bob holds a PhD in industrial-organizational psychology and has written three books on the topic of customer experience, measurement, and analytics, and blogs regularly on these topics. He is considered a top social influencer in the data science and machine learning space. Follow Bob on Twitter at @bobehayes. Dr. Jennifer Prendki is a Data Science and AI executive with a passion for building and scaling highly effective Data Science teams and helping businesses monetize on their data assets. She recently joined Figure Eight (previous known as CrowdFlower) as their VP of Machine Learning, and focuses on helping companies of all kinds make Artificial Intelligence work in a human world. Prior to joining Figure Eight, she held the positions of Head of Data Science at Atlassian and Senior Data Science Manager in the Search team at Walmart eCommerce. She is also a member of the Expert Panel at the International Institute for Analytics, and a technical advisor to several start-ups. She received her PhD in Particle Physics from Sorbonne Université in 2009 and has since then worked as a data scientist for a vast range of different industries. One of her favorite activities is to address both technical and non-technical audiences at conferences and share her knowledge and experience with aspiring data scientists. Kamelia Aryafar, Ph.D. is the Head of Machine Learning (ML), AI and Vice President and Head of Data Science at Overstock.com. She leads a team of data scientists and machine learning engineers focused on building scalable ML/AI and computer vision tools to curate a personalized experience for Overstock users. Prior to Overstock she has been a Senior Machine Learning Scientist at Etsy for more than four years. Before Etsy, she was doing a Ph.D. in computer science and machine learning in Drexel University, building large-scale classification models. Alex Vayner leads Capgemini North America Data Science & Analytics practice. Alex’s team works across all industries, driving the transformation of companies into insight-driven enterprises through the use of machine learning techniques, Artificial Intelligence and cognitive technologies. Alex has spent his entire career in data & analytics, with his last four roles focused on building and running high performance data science teams and capabilities in consulting and corporate environments. Alex joined Capgemini from Equifax, where he served as VP, Global Data Innovation Leader, building a team responsible for pioneering disruptive data & analytics solutions for clients across all industries. Earlier in his career Alex held several analytics leadership roles in global management consultancies and public technology companies. Alex earned his bachelor’s degree in mathematics from University of Florida and his master’s degree in applied mathematics from Georgia Tech. Claudia Perlich is a Senior Data Scientist at Two Sigma in New York City. Prior to her role at Two Sigma, she was the Chief Scientist at Dstillery where she designed, developed, analyzed, and optimized machine learning that drives digital advertising to prospective customers of brands. She started her career in Data Science at the IBM T.J. Watson Research Center, concentrating on research in data analytics and machine learning for complex real-world domains and applications. She tends to be domain agnostic having worked on almost anything from Twitter, DNA, server logs, CRM data, web usage, breast cancer, movie ratings and many more. Perlich is still actively publishing, and has published over 50 scientific publications as well as a few patents in the area of machine learning. She received her PhD in Information Systems from the NYU Stern School of Business, and holds a Master of Computer Science from Colorado University. Haile Owusu is Senior Vice President of Analytics, Decisions and Data Sciences at Turner Broadcasting. Haile specializes in statistical learning as applied to forecasting and has a background in theoretical physics, including a PhD from Rutgers University, a Masters of Science from King's College, University of London and a B.A. from Yale University. Carl is a hands-on senior data scientist, formerly leading data and data science at Warby Parker and WeWork. His career has taken him through a number of domains such as biology, politics, healthcare, robotics, architecture, and e-commerce. He is passionate about making organizations data-driven. In 2015, he published a book with O’Reilly entitled “Creating a Data-Driven Organization” which covers topics spanning data quality and cleaning, analytical skills, data visualization, and decision making. He blogs on data science, AI, and statistics at Medium, https://datascience.wine/, http://www.p-value.info/ and on twitter @leapingllamas. William Ford is the Director of Data Science for Learning Services at Chegg. Over the last two years at Chegg, he built a team that sits at the intersection of the Product, Business, and Engineering groups. The team delivers insights and systems focused on improving business outcomes leveraging advanced analytics to support Chegg’s rapid growth. He got his start in distributed computational modeling in 2001. In 2003, he shifted to Machine Learning/AI when he started graduate school at the California Institute of Technology where he ultimately received a PhD in Computation and Neural Systems. Before joining Chegg, he worked as a Data Science consultant and then led data science teams for multiple startups. David Robinson is the Chief Data Scientist at DataCamp, where he guides analysis and research to help teach the next generation of data scientists. He has worked as a data scientist at Stack Overflow and received his PhD from Princeton University. He is the co-author with Julia Silge of the tidytext package and the O’Reilly book Text Mining with R. He is also the author of the broom, gganimate, and fuzzyjoin R packages and of the e-book Introduction to Empirical Bayes. He writes about R, statistics and education on his blog Variance Explained, as well as on Twitter as @drob. Kate Strachnyi is the author of Journey to Data Scientist; which is essentially compilation of interviews that Kate herself conducted with over 20 amazing data scientists. — with backgrounds ranging from LinkedIn and Pinterest to Bloomberg and IBM. She is also the creator of Humans of Data Science (HoDS) - a project that works on showing the human side of data science (housed on her Story by Data YouTube channel). Kate is a manager working for Deloitte, currently working in the data visualization & reporting space. She previously served as an insights strategy manager and research analyst, where she was responsible for enabling the exchange of information in an efficient and timely manner. Prior to working with data, she focused on risk management, governance, and regulatory response solutions for financial services organizations. Before joining the consulting world, she worked for the chief risk officer of a full-service commercial bank, where she was in charge of developing an ERM program, annual submission of ICAAP, and gap analysis of Basel II/III directives. Additionally, she worked as a business development associate at the Global Association of Risk Professionals (GARP). Kate received a bachelor of business administration in finance and investments from Baruch College, Zicklin School of Business. Certifications include Project Management Professional (PMP) and Tableau Desktop 10 Qualified Associate. Brent is the Director of Data Strategy at Domo and has 15 years of enterprise analytics experience at Omniture, Adobe, and Domo. He is a regular Forbes contributor on data-related topics and has published two books on digital analytics, including Web Analytics Action Hero. In 2016, Brent received the Most Influential Industry Contributor Award from the Digital Analytics Association (DAA). He has been a popular presenter at multiple conferences such as Shop.org, Adtech, Pubcon, and Adobe Summit. Brent earned his MBA from Brigham Young University and his BBA (Marketing) degree from Simon Fraser University. Follow him on Twitter @analyticshero. An Executive Recruiter at Burtch Works, Naomi Keller began her career in marketing research, working with Knowledge Networks, Ipsos, and GfK. She then transitioned to the talent acquisition field, working within HR-technology as an account manager at LinkedIn and Yello, a start-up in Chicago. At Burtch Works, Naomi leads the data science recruiting team, working with companies ranging from Fortune 100 corporations to growing startups across the US, helping them to establish and grow their data science teams. Naomi's thorough knowledge of the quantitative community and the talent landscape give her a unique perspective when partnering with data science professionals and hiring authorities. Brandon loves solving puzzles and building things. Practicing data science gives him the opportunity to do both in equal measure. Like most data scientists, he came to the field indirectly. He started by studying robotics and human rehabilitation at MIT (MS '99, PhD '02), moved on to machine vision and machine learning at Sandia National Laboratories, then to predictive modeling of agriculture DuPont Pioneer, and cloud data science at Microsoft. Now at Facebook he works to get internet and electrical power to those in the world who don't have it, using deep learning and satellite imagery. In his spare time he likes to rock climb, write robot learning algorithms, and go on walks with his wife and their dog, Reign of Terror. Jerry Overton is a data scientist in DXC Technology’s Analytics group. He leads the strategy and development for DXC's Industrialized AI offering. Jerry is the author of the O'Reilly Media eBook, Going Pro in Data Science: What It Takes to Succeed as a Professional Data Scientist. He teaches the Safari Live Online training course, "Mastering Data Science at Enterprise Scale: How to design and implement machine-learning solutions that improve your organization." In his blog, Doing Data Science, Jerry shares his experiences leading open research and transforming organizations using data science. Ben Odom leads a team of fellow Developer Evangelists with Intel’s Developer Relations Division. Currently Ben’s focus is on Artificial Intelligence, developing coursework for Intel’s AI Academy, and delivering workshops to University students and developers interested in how to take advantage of optimized frameworks and libraries on Intel architecture. Previously Ben worked on Intel’s HTML5, Android and IOT developer outreach programs. Ben has a Masters Degree in Computer Science and Engineering from Oregon Health Sciences University. Renée M. P. Teate is the creator of the popular Becoming a Data Scientist Podcast and @becomingdatasci twitter account. She has worked with data for her entire career, from designing databases for small businesses to analyzing customer and alumni data for Rosetta Stone and James Madison University, to most recently developing predictive models and dashboards at Higher Ed startup HelioCampus as a Data Scientist. She has degrees from James Madison University and the University of Virginia, but has continued her own self-driven data science education online, and regularly speaks to others about learning Data Science. Favio Vázquez is making this world a better place step by step using AI, Data Science and helping others. Vin has 20+ years in tech (9 in data science & machine learning, 10+ in leadership). He has built products with revenue streams in the $100s of millions and saved companies just as much. He is a strategist for clients in the Fortune 100 to startups. Sarah Nooravi is a lifelong learner and data geek. She has a history of delivering innovative marketing tools to help drive better business decisions in the entertainment and gaming industries at Operam and MobilityWare. She is also passionate about teaching and giving back to the community. In that spirit, she is teaching a DataViz Bootcamp through USC, she leads and coordinates monthly Machine Learning meetups at Ticketmaster, and she mentors aspiring data scientists and engineers. All of these activities support a core motivation for Sarah: helping set up others for success in industry. Eric loves working with data and teaching others. Those two passions drive his interest in seeing the field grow and helping others find their place in it. His experiences in academia, the tech, medical and property/mortgage industries as both an individual contributor and leader help him to help organizations become data driven and to hire the right data scientists for the job. Mark knows first-hand how difficult it can be to break into data science. With a degree in mathematics, not statistics or computer science, he was attempting to make a mid-career transition into the hottest field around. It was tough going at first: one tech recruiter even told him that he was “unemployable” as a data scientist and that she wouldn’t waste her time on him! But after a lot of research on job hunting techniques and painful trial-and-error, he was able to figure out how to crack the code to get hired. He now works in Silicon Valley as a data scientist at ServiceNow, officially “The fastest growing enterprise software company with more than $1 billion in revenue”. As part of his duties there, he interviews candidates for data scientist positions, giving him valuable experience on both sides of the interviewing table and unique insight into what companies are really looking for in applicants. He provides job seekers with the information they need to know to break into this data science on his website, http://MarkMeloon.com. Safia is the solo founder of Zarf, an online marketplace for short-form fiction and non-fiction by night. In the past, she’s been a maintainer and collaborator in the Python open source data science space and an instructor of data science. Randy works as a Data Science / Machine Learning Assistant in two data bootcamps: Trilogy Education (@ USC) and Data Application Lab. He also works at a nonprofit organization, IDEAS (International Data Engineering and Science Association), which is creating a data science learning platform to connect data science enthusiasts. Randy is a big supporter of this awesome data community and loves to contribute his resources to help others learn. Deborah Berebichez is a physicist, data scientist and TV host. She has expertise in scientific research and advanced analysis and she has helped automate decision-making and uncover patterns in large amounts of data. Her passion lies in merging critical thinking skills with practical coding skills. She specializes in drawing connections between the approaches used in data science and the challenges organizations face. Deborah has a Ph.D. in physics from Stanford and completed two postdoctoral fellowships at Columbia University's Applied Math and Physics Department and at NYU's Courant Institute for Mathematical Sciences. She is a frequent mentor of young women in STEM. Her work in science education and outreach has been recognized by the Discovery Channel, WSJ, Oprah, Dr. Oz, TED, DLD, WIRED, Ciudad de las Ideas and others. Follow Deborah on Twitter at @debbiebere. Michael comes to Metis from General Electric where he worked to establish their data science strategy and capabilities for field services and to build solutions supporting Global operations, risk, engineering, sales, and marketing. He also taught data science and machine learning for General Assembly. Prior to GE, Michael spent several years as a data scientist working on problems in credit modeling at Kabbage and corporate travel and procurement at TRX. Michael holds a Bachelor's degree in Mathematics and a Master's degree in Computational Science and Engineering from the Georgia Institute of Technology where he also spent 3 years working on machine learning research problems related to computational biology and bioinformatics. Additionally, Michael spent 12 years in the United States Marine Corps where he held various leadership roles within aviation, logistics, and training units. In his spare time, he enjoys running, traveling, and reading. Whenever I meet someone interested in starting a data science career, my first advice is to start a blog. In this talk, I'll lay out the reasons that a data science blog is well worth your time and effort, even in the midst of a busy job search. A blog is a great accompaniment to data science coursework and tutorials, since it gives you experience applying practical data science skills to real problems. You'll particularly learn to communicate your results, which is an essential component of data science work. You'll also create a public portfolio of your skills, get feedback from your peers, and network with the larger data science community. I'll give several examples of the kinds of blog posts you can write even if you're early in your career, ranging from explorations of interesting datasets to explanations of statistical methods you've mastered. Data visualization is a key step in the data science/ analytics process. If the data team is unable to clearly relay findings & insights to the target audience or decision maker it defeats the purpose of the analysis. This talk will uncover some of the common challenges faced by data analysts/scientists during the data visualization process (e.g. selecting the wrong charts, not speaking the same language, visualization clutter, information overload, etc.). We will also discuss some guidelines on how to overcome these challenges. If you haven’t already discovered it, you’ll soon realize that getting a job as a data scientist requires a combination of several skills. With so much competition, it’s simply not sufficient to merely know the material; you need to know how to interest an employer so you can demonstrate your skills in the first place! This talk will help you get a job by showing you how to uncover secret job opportunities others don’t know about, what to do if you don’t have an advanced degree or prior job experience, what employers are truly looking for in a candidate, how to avoid wasting time, and much more. It took me quite a bit of time—and lots of painful trial and error—to break into the field and I’m eager to share my system that will help you avoid my mistakes. I have years of experience looking for jobs, interviewing candidates, and even picking the brains of recruiters! I’ll be sharing all the secrets this during this talk so don’t miss it! Data science is a way to solve problems using data and analytics. To ensure data science success, you need to provide data professionals with an environment that is open, engaging, and fosters collaboration. For those who want to explore how you or your data science team can optimize the value of your data, this talk is for you. In this talk, I will present the latest research on people, processes and technologies behind the insights. The talk will help aspiring data professionals better understand how they can contribute to data science projects. I will cover topics related to data science skills, organizational factors and the use of popular technologies and tools that drive insights. Given a new dataset, how do you get started with analysis? What does it mean to "explore" a dataset? Where does data cleanup fit into the exploratory stage? What are some common Exploratory Data Analysis (EDA) techniques? What questions can you ask and answer of your data? How much exploration is "enough" before moving on to machine learning tasks? We'll "explore" these questions and more based on Renee's experience as a data analyst and data scientist, to hopefully get your next (or first!) analysis project off to a strong start. “Data science” means a lot of different things. The list of skills and tools it includes is overwhelming. It’s difficult for those who want to become one to know where they should start. In this talk we’ll break the field down into five sub-disciplines and the skills that go with each. We’ll also talk about some common roles and how to read job postings to figure out which one they are really after. When we’re done, you’ll be able to better choose the role you want and know what you need to do to train for it. Copy and paste as much code as you can. Appreciate but take a pass on most peer-review feedback. There are three skills even more useful than mathematics, computer science and domain expertise. There are lots of things they don’t tell you in data science blogs. Come with questions. Jerry Overton gets candid about what it takes to go pro in data science. Data science in the enterprise; it’s not what you think. In academia, the word ‘science’ is the most important part of the title. Rigorous, well defined, detailed, science. The real-world is much more complicated. In the enterprise, it’s all about time to insight. Project timelines are dictated to you by business needs and customer demands, not the realities of data science methodologies. Two words…cold start. The data you have wasn’t gathered using anything like best practices. It’s in 10 databases, dozens of spreadsheets, and boxes of documents stacked in a room at the end of the hall. Need more data? None of the groups who can help you get it have the budget to support you so while they’d love to help, it’s just not something they can do right now. The engineering team you rely on to get your models into production isn’t pleased by code that’s not commented, uses single letters for variable names, and is written in a language they don’t use. That model file you gave them to deploy? They’re not really sure what to do with it so if you’re not, chances are it isn’t getting deployed any time soon. And that’s just your first 90 days. I haven’t even gotten to senior leadership bringing you in to discuss their vision for data science which changes every time they talk to you and none of them agree with each other. Burnout in the data science field is high and rising. That’s because what you’ve been told you do is nothing like what you really do. I’ll get you ready for reality because it’s nothing like Kaggle. Data storytelling is the most effective way to communicate data. As the volume, velocity and variety of data grows, so do the skillsets required to make sense of it. To derive the meaningful insights derived from AI, data must be communicated in a clear, logical and simple story. In this session you will learn how to use the power of storytelling to create a four part data story that drives insights and actions! We'll dig into the four parts every data story must have, the five critical questions you need to answer and what to expect. There's a lot of concepts to cover in Data Science and it can get overwhelming. This presentation will be heavily focused on what people should be focusing on when getting into the field of Data Science. I'll be going over a brief introduction about the topic, talking about the various skills and concepts one must have, and a rough guideline on how to get started. After this presentation, the viewers will be more confident, excited, and prepared about what to expect in this field! Data science, and business more broadly, is a people industry. The relationships you form, the connections you make, the people you know, the coworkers you help and the boss you impress all play a role in starting and advancing your career in the field. In this talk, I focus on how to develop, sustain and grow these people relationships, both prior to looking for a data science job and once you've landed that coveted position. It will also tie these in with the five pillars of data science, which I define as: Coding, Analytics, Communication, Creativity and Domain knowledge. In many data visualization packages, the user must spend a significant amount of time thinking about details of how the plot should be constructed: how lines should be drawn, how axes should be labeled, how legends should be placed. This imperative approach to visualization gets the job done, but is there a better way? In this talk I'll introduce and demonstrate the Altair package, a declarative visualization tool in Python that lets you focus less about the detailed mechanics of how a visualization is drawn, and more on the ideas it conveys. With Altair you can quickly create beautiful interactive visualizations to gain insight from your data with a minimal of boilerplate code. In this age of disruptive, emergent change, we must navigate uncertainty and move forward without all the answers. Everyone's job now is about change. This requires new capabilities and that teams be led differently. We'll discuss how. We will discuss why data scientists todays are changing jobs often, best practices for hiring the right people for the right role, creating environment that enables one to get value quickly and maximize retention, and how investing in people individually is the best way to achieve long term growth in data science. This presentation will describe some of the top trends in data science this year (including DataOps, Journey Sciences, IoT as the "Internet of Context", and A.I. as a real business benefit beyond Artificial Intelligence, such as Amplified, Assisted, Augmented, Accelerated, and Actionable intelligence). The presentation will include practical suggestions on how to implement a data analytics strategy and implement a POV (Proof Of Value) from these top trends for quick wins in your organization. Having a data-driven experimental orientation (which is the essence of data science), throughout the business, is essential. The business cultural change required to adopt data science as a way of doing things (and not just a thing to do) is perhaps a greater challenge than the technological challenges. Demonstrating value and ROI (Return On Innovation) from small implementations and POVs will inspire the cultural change that will be needed for the larger implementations that will come. Adopting a culture of experimentation is good data science, and adopting a data analytics strategy is good business. Can Machine Learning Transform Business? Experiences from the trenches! It should come to no surprise that even prior to building Watson, IBM was for a long time experimenting with AI and Machine Learning technology. Not only was IBM filing patents and providing solutions to their customers, but it also had an internal group for “Enterprise on Demand Transformation” that worked as the equivalent of an internal consulting arm connecting IBM business units with teams of statisticians, computer scientists and machine learning experts to solve very specific ‘data science’ challenges long before the term even existed. The talk presents a number of short case studies from those engagements providing some insight into the organization of the involved groups and highlights why some projects succeed and others failed. Try to imagine the perfect data source for a data science project: it would likely consist of timely, relevant, and high-quality data with clear documentation and comprehensive metadata. That is, a data scientist could easily know what the data were, where it came from, what issues exist in the data, and what each field and term meant. In this talk, I’ll cover how a data team can support data science by establishing best practices for data ingestion, data storage, and data quality in general. I’ll also cover practical issues and the process for creating a data dictionary and the value of a single source of truth. The Chegg data flywheel is a framework for integrating insights from our users across multiple projects. We will discuss developing innovative internal and external product offerings based on these insights. Chegg, the leading connected learning platform, supports students with a suite of digital product offerings including study and writing help, textbook rentals, career services and online person-to-person tutoring. Throughout the talk, will also touch on de-risking data science work with a two-track system that is heavily influenced by the two-track product development framework of Marty Cagan (Silicon Valley Product Group). Data Science as a field has been growing exponentially everywhere in the world. The countries from Latin America are no exception to this expansion; in this talk I'll discuss my experience doing Data Science here. We are a special group of people with very specific needs and problems, and building a team and change an organization to be data driven presents unique challenges that we are overcoming. With examples and use cases, I'll present how our countries are developing these areas and becoming an important place to do Data Science. By 2020, it is estimated companies will spend more than $200B on big data and analytics tools and services. Both technology and people are essential to unlocking the power of data. In the hands of your company’s data experts, analytical tools can be used to uncover valuable insights that can shape your strategy and improve your performance. However, if the data is only used by a small group of data scientists and analysts, your company will never be able to unlock your data’s full potential. Only when data is democratized throughout your company at all levels will you see a significant return on your data investments. Many organizations are only now realizing that their employees lack the data literacy skills to take advantage of all the data they're collecting. This session will examine why organizations need to begin addressing the data literacy gap and define a minimum viable level of data literacy for all employees. In this talk we will explore the applications of different facets of AI ( machine learning, deep learning, NLP and computer vision) in online retail and e-commerce. We will walk through practical examples of how AI can be used to personalize customer experience and revolutionize your customer journey through personalized marketing campaigns, personalized recommendations, supply chain, CRM, reranked search and more. Kamelia will share her thoughts on building successful AI teams and an experiment-driven culture that will reshape your business by enhancing customer experience through AI. Let's assume a business has built a highly capable, nicely aligned data team with access to a pristine data pipeline -- how should non-data people think through the optimal interaction? The data science market has undergone drastic changes thanks to the Big Data hype of the past few years, so how has this affected the hunt for these “unicorns” of the analytics world? And, what do these changes mean for employers looking to hire and retain data scientists on their staff? Burtch Works’ data science recruiting specialist, Naomi Keller, examines the latest demographic and hiring market trends that affect recruitment, salary bands, and the leading factors that encourage data scientists to leave or stay at their jobs. Whether you’re hoping to expand your data science team or just looking keep your current rockstars happy, this presentation has everything you need to know about today’s hiring market. In this presentation, we'll be exploring methods and techniques for communicating data use and storage to customers. This talk will go beyond covering what you have to communicate and discuss what you should communicate to build a healthy relationship with data around your product. Attendees will leave this talk with an understanding of the importance of communicating with customers in the data science workflow, samples of communications with customers, and tips for explaining data use to non-technical customers. Intel has made several strategic investments in AI over the past couple of years via acquisitions, new product development and open source software contributions. In addition we have developed a free software Academy for students and ISV’s alike. Coupled with compute resources and support forums come learn about these efforts and how Intel can help you accelerate your exploration of Data Science on Intel Architecture. In the Age of Big Data and the promises of AI, more and more companies are jumping the bandwagon and deciding to bring Data Science to their organization. According to Gartner, 90% of large companies will have a Chief Data Officer by 2019, which seems highly encouraging. That being said, bootstrapping a successful data function requires much more than a talented data leader: in fact, it requires dramatic change of mindset across the entire organization, which the new data team will have to promote while concurrently dealing with the other technical issues traditionally associated with the task of building a data function. This is because Data Science departments cannot operate in a vacuum, but require the support of virtually every single function in the company. In this talk, I will discuss why a complete cultural shift is necessary to the success of a young Data Science team. I will also give some tips on how to make this necessary changes happen and increase your chances of success. Brought to you by Metis. Metis is a leading provider of data science training for individuals and businesses. We deliver training programs designed by world-class industry practitioners and run the industry’s only accredited intensive data science bootcamp. Metis is accredited by the Accrediting Council for Continuing Education & Training (ACCET). Copyright © 2018 Kaplan Inc. All Rights Reserved.